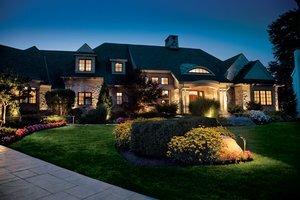 Well-planned outdoor lighting improves curb appeal, safety, and security for your home. Think about it: Most of your guests (and if your home is on the market, many would-be buyers) see your home only in the evening, when its best features may be lost in the shadows. Well-executed outdoor lighting enhances architectural detail and plays up landscape features, casting your home in the best possible light and adding an abundance of curb appeal. Outdoor lighting also adds value. Judith Patriski, an appraiser and owner of Quad Realty Co. near Cleveland, estimates that for upper-bracket homes, an investment in outdoor lighting can yield a 50% return. “When you pull into a driveway and see a gorgeous home, you’re going to pay more for it,” says Patriski. And she emphasizes that it’s not only about aesthetics: “In all price ranges, lighting for security is important”—both to protect against intruders and falls. Here are the elements of successful outdoor lighting. Much of the success of exterior lighting hinges on its design. Hang around lighting designers long enough and you’ll hear a lot of talk about “moonlight effect.” That’s a naturalistic look that features light no more intense than that of a full moon, but still strong enough to make beautiful shadows and intense highlights. Highlight trees: Whether illumined from below or given presence by a light mounted in the tree itself, trees make stunning features. Use uplights: Uplighting is dramatic because we expect light to shine downward. Used in moderation, it’s a great way to highlight architectural and landscaping features. Combine beauty and function: For example, adding lighting to plantings along a pathway breaks up the “runway” look of too many lights strung alongside a walk. Vary the fixtures: While the workhorses are spots and floods, designers turn to a wide range of fixtures, area lights, step lights, and bollards or post lights. Stick to warm light: A rainbow of colors are possible, but most designers avoid anything but warm white light, preferring to showcase the house and its landscape rather than create a light show. Orchestrate: A timer, with confirmation from a photocell, brings the display to life as the sun sets. At midnight it shuts shut down everything but security lighting. Some homeowners even set the timer to light things up an hour or so before dawn. Falls are the foremost cause of home injury, according to the Home Safety Council. Outdoors, stair and pathway lighting help eliminate such hazards. Often safety and security can be combined. For example, motion-detecting security lighting mounted near the garage provides illumination when you get out of your car at night; the same function deters intruders. Motion detecting switches can also be applied to landscape lighting to illumine shadowy areas should anyone walk nearby. Even the moonlight effect has a security function: Soft, overall landscape lighting eliminates dark areas that might hide an intruder, exposing any movement on your property. Overly bright lights actually have a negative effect, creating undesirable pockets of deep shadow. Another advantage is long life. LEDs last at least 40,000 hours, or about 18 years of nighttime service. With that kind of longevity, “why should a fixture have only a two-year warranty?” asks Gosselin. He advises buying only fixtures with a 15-year warranty, proof that the fixture’s housing is designed to live as long as the LED bulbs inside. Solar lighting: When first introduced, solar pathway lights produced a dull glow that rarely made it through the night. They do much better now that they are equipped with electricity-sipping LEDs, more efficient photovoltaic cells, and better batteries. Still, they have yet to measure up to hard-wired systems. Hybrids: Porch lights now come equipped with LED lighting for all night use, and a motion sensor that clicks on an incandescent bulb to provide extra illumination as you approach the front door. Hybrids use about 5% of the power a solely incandescent fixture requires. Barbecue light: Tired of grilling steaks by flash light? Now you can buy a gooseneck outdoor light, ideal for an outdoor kitchen. Total outdoor lighting costs will vary according to the size of your home and the complexity of your lighting scheme. Expect to pay about $325 for each installed LED fixture. LEDs also require a transformer to step the power down from 120 volts to 12 volts, running about $400 installed. A motion detector security light costs about $150 installed. Porch lights and sconces range from $100 to $250 installed, depending the fixture and whether running new cable is necessary. Dave Toht has written or edited more than 60 books on home repair and remodeling, including titles for The Home Depot, Lowe’s, Better Homes & Gardens, Sunset, and Reader’s Digest. A former contractor, Dave was editor of Remodeling Ideas magazine and continues to contribute to numerous how-to publications.